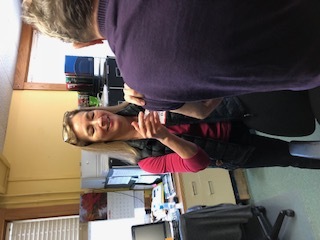 Although the flu clinic season is over, and the district vaccinated over 1000 people, the Cooperative Public Health Service (CPHS) is still able to offer influenza vaccines (with no insurance co-pay) to area residents at regularly scheduled wellness clinics throughout the region. • First Friday of each month at the Conway Town Hall on: 9 AM –12 PM. • Third Tuesday of every month at the Good Neighbors Food Distribution at the Charlemont Federated Church at 5 PM. 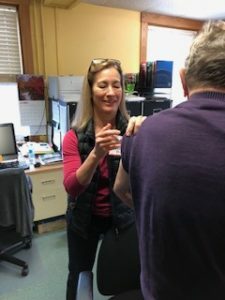 A Leyden resident gets vaccinated by Public Health Nurse Lisa White on election day, 2018. Bring your insurance cards – most forms of insurance are accepted – or, if you do not have a billable insurance, bring $20 for the fee for adults and $10 for kids. Both injectable and flu mist formulas for kids will be available this year. Regular or Senior High-Dose formulas available for those over age 65. Contact Lisa White, RN, Regional Public Health Nurse of FRCOG, at 413-665-1400 x114 for updated schedule and more information or visit this page regularly. Everyone six months of age or older needs a flu vaccine. When we all are vaccinated, we build community immunity that protects the elderly, children, and those with compromised immune systems from the terrible effects of influenza. For more information on the CPHS, click here.